11:09 am: In just 4 decades, Reliance has grown from a small startup to one of the largest, most admired companies in the world Mukesh Ambani. 11:10 am: Our turnover has grown from 70 crores in 1977 to over 330,000 crores today – an increase of nearly 4,700 times. 11:11 am: Our total assets have increased from 33 crores to over 700,000 crores and a multiple of over 20,000 times. 11:12 am: Above all, market capitalization has multiplied from ten crores to over five lakh crores. One thousand rupees invested in Reliance shares in 1977 is today worth Rs 16,54,503 – over 1,600 times more valuable. 11:13 am: In simple terms, this means that your money has doubled every two and a half years over the past 40 years. 11:15 am: I want to dedicate these 40 years of achievements and records to our founder Chairman Shri Dhirubhai Ambani. Jio has broken one world record after another. 11:18 am: In less than 170 days, more than 100 million customers signed up for Jio’s services, On an average, Jio added 7 customers per second every single day. 11:19 am: This was the fastest adoption of any technology service, anywhere in the world. Faster than Facebook, WhatsApp, Skype. Today Jio has over 125 million customers. We have proved all our sceptics wrong. 11:22 am: In just 6 months of Jio’s launch, data consumption in India went from 20 crore GB to 120 crore GB per month. Now, Jio customers alone are consuming over 125 crore GB of data a month, including 165 crore hours high-speed video every month making Jio the largest mobile video network. 11:23 am: Indeed, India has overtaken the US and China in mobile data usage. Before Jio’s launch, India was 155th in the world in mobile broadband penetration now India is No 1 in mobile data consumption. 11:25 am: Today, Jio has more than 100 million paying Jio Prime customers. Most have recharged on Jio’s Rs 309 or higher plans. 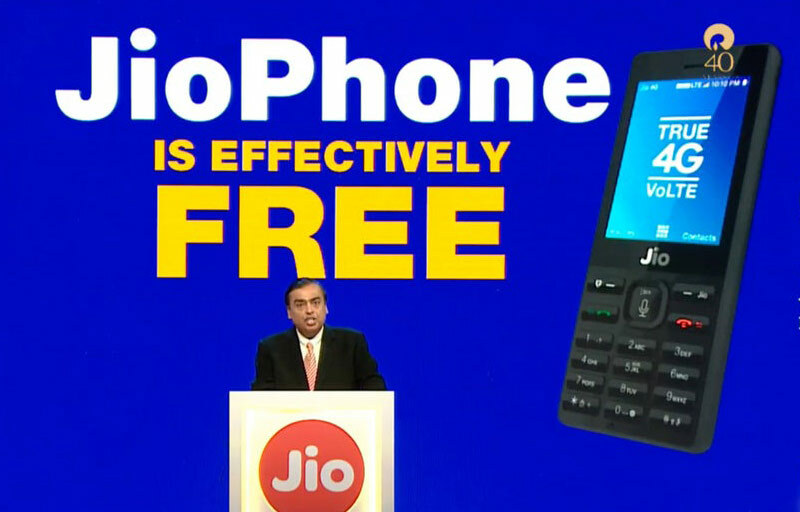 11:58 am: To protect against misuse of the free Jio Phone offer we plan to collect a fully refundable, one-time, security deposit of Rs 1,500 with every Jio Phone. 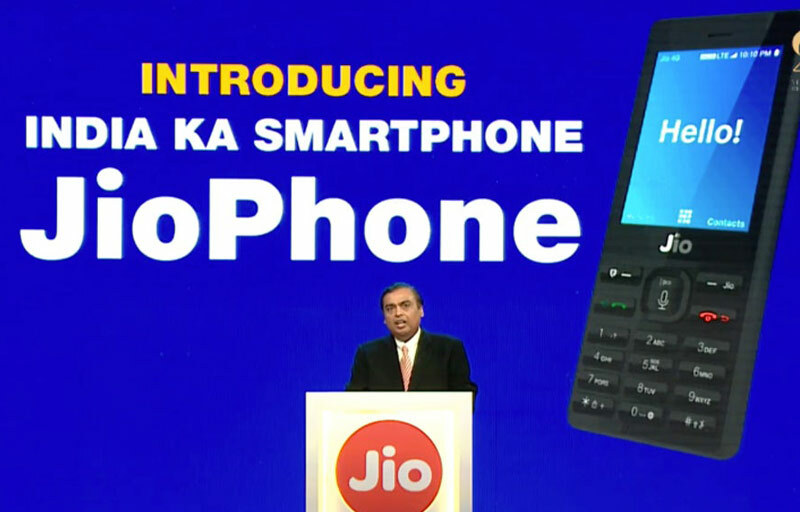 Jio will offer its feature phone for Rs 0. Mukesh Ambani says, Customers will be asked to pay Rs 1,500 as security deposit for the device, which will be refunded after 3 years. From 15th August 2017, all Indians will have access to the highest quality & quantity, affordable & unlimited data. 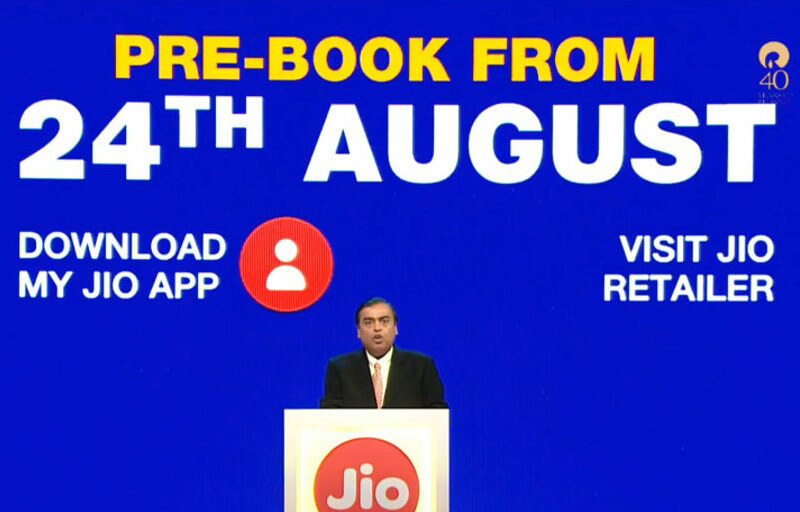 12:02 pm: The Jio Phone will be available for user testing in beta from 15th August and for pre-booking from 24th August. Download RIL Chairman and MD Mukesh Ambani’s 40th AGM speech. New data plans which start at Rs 153 for the device. Users can even listen to Prime Minister Modi’s podcast Mann ki Baat on the Jio feature phone. Also, the NaMo app will come pre-loaded on the device. This new Jio phone supports Near Field Communication (NFC) which can be used to make digital payments like as Apple Pay and Samsung Pay. From last quarter of 2017, all Jio Phones will be made in India. We are targeting to have 5 million Jio Phones a week. 12:05 pm: Jio is a young organisation and Akash and Isha, our Directors, both 25, lead a large contingent of highly talented professionals. 12:30 pm: As Reliance marches towards its Golden Jubilee, today we commence our Golden Decade. We will always live by your ideals, vision & values and build a New India of Dhirubhai’s dream says Mukesh Ambani. “This is our solemn commitment. And this is my promise to all of you” he added. 12:31 pm: The net profit of Rs 29,901 crore is the highest in the Indian corporate sector. Reliance remains India’s largest exporter with 8% of total merchandise exports with a value of Rs 147,755 crore. 12:32 pm: Reliance paid 29,637 crore of customs and excise duty during the year, almost 5% of India’s total. Reliance is the highest income tax payer in the private sector in India and paid Rs 8,880 crore as during the year. We, at Reliance, congratulate the Government on its historic step of introducing the GST regime. GST brings uniformity in tax rates and enables India to fulfil One Nation One Tax, resulting in one unified market. 12:34 pm: On such an occasion and in keeping with our founder to share prosperity with all shareholders the Board of Directors has decided to recommend a bonus issue in the ratio of 1:1. 12:36 pm: This is the largest bonus issue, ever, in India. We have commissioned our Paraxylene complex, making Jamnagar world’s largest manufacturing facility of Paraxylene. 12:40 pm: Our projects will place Reliance as among the top 10 Petrochemical producers globally. Our refining business continues to demonstrate exemplary performance. We are proud to say that one in every ten Indians shops with us. This year, Reliance Retail crossed Rs 33,000 crores. 12:43 pm: 371 new retail stores were opened last year, an unprecedented expansion in India by any retailer. Every minute, 8 smartphones; every hour, 42 laptops and 68 TVs are sold at Reliance Digital. 12:45 pm: In fuel retail, we re-commissioned 142 new outlets during the year. Reliance Foundation has emerged as the largest corporate Foundation in India and reaches out to 12 million people. 12:47 pm: Reliance Foundation has improved the productivity of land for over 50,000 families and made 131 villages water-secure. Reliance Foundation’s Education for All initiative now impacts the lives of 100,000 children. 12:48 pm: Reliance Foundation is committed to creating opportunities for the youth to pursue a career in sports. In its first year, Reliance Foundation Youth Sports reached 8 cities and reached over 2 million children. 12:51 pm: I now want to share with you my vision for value creation at Reliance over the next decade. India@80 should aspire to become – and can certainly become – one of the three largest economies in the world. Reliance@50 will aspire to become – and will certainly become – one among the Top 50 companies in the world. Reliance’s future value-creation strategy will support tens of thousands of small and medium businesses. 12:55 pm: Reliance ready to participate in 4th Industrial Revolution. Over the next decade, India has the potential to move from a $2.25 trillion economy to a $6 trillion economy. I am confident that Reliance’s own growth over the next ten years and our contribution to the Indian economy will surpass what it has achieved in the past 40 years. 12:56 pm: What took the West 300 years and China 30 years, India can achieve in just about a decade or two. 12:57 pm: Our energy & materials businesses constitute a strong platform to reach EBITDA of Rs 100,000 crore in next few years. 12:58 pm: Jio’s business and societal value will grow immensely over the next decade. Jio will become India’s largest provider of data service, products and application platforms. 01:00 pm: Reliance will build, within a decade, new businesses of the same value as our existing businesses. As we celebrate the 40th anniversary of our company, it will serve us well to recall our Founder’s words of wisdom. Team work! Still more team work. The Golden Decade of Reliance has begun.